China’s steel producers, which account for around half of the global supply, saw their production drop in 2015 for the first time in a quarter century. But exports have gone up, and they are expected to increase in 2016; a combination of slumping domestic demand, excess inventory and production, and an increasing gap between supply and demand means that the world will need to start bracing itself for a flood of more cheap Chinese steel. According to official statistics, Chinese steel production decreased 2 percent to 803.8 million metric tons last year. China’s domestic demand for steel dropped, and steel mills faced excess capacity on lower steel prices due to a slowing global economy. The decline will likely continue for 2016, as analysts expect another drop of between 2 and 3 percent this year. While steel production and domestic demand are down, Chinese steel mills have found a new outlet for their goods—foreign markets. The excess production led to Chinese steel producers exporting cheap steel to foreign markets—a trend likely to increase this year—which could have huge ramifications for regional producers globally. Steel exports from China increased 20 percent to 112.4 million tons in 2015, according to data from the General Administration of Customs. It was the first year ever that steel exports topped 100 million tons. Chinese steel producers exported 10.7 million tons in December 2015, an 11 percent increase from November. There’s little relief in sight for Chinese steel producers. Weakness in China’s domestic property market—the main consumer of steel globally—is expected to continue in 2016. While real estate sales growth is expected to stay flat or even increase marginally in 2016, real estate sales aren’t a big factor in steel demand. Construction activity is the biggest single indicator for steel demand, and new construction growth in China is predicted to decline for 2016. Total construction output between 2014 and 2020 is expected to grow at around 3.9 percent annually, and housing construction is expected to grow at a pace of only 2.5 percent during the same period, according to a report by GCP Global released in December 2015. Conventional wisdom would dictate cutting back production and capacity for steel production in light of weaker demand. But most steel mills in China are state-owned enterprises, where political backlash from job losses would be detrimental to the Chinese Communist Party’s grip on power. Such political reasons are keeping steel mills humming. China’s recent decision to devalue the yuan has further encouraged foreign demand for Chinese steel, as a cheaper yuan has made Chinese exports less expensive in foreign markets. Low costs of inputs (cheap domestic iron ore) coupled with a weak currency have enabled Chinese producers to sell their products at below-market rates to the United States and Europe. 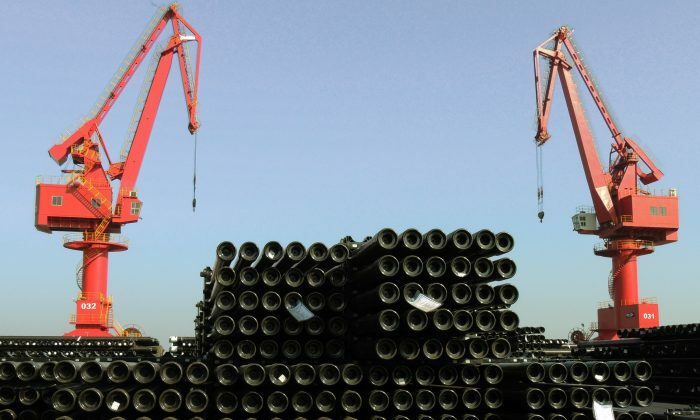 A few countries have contemplated anti-dumping duties on Chinese steel products. In December, the United States imposed anti-dumping tariffs on China-produced corrosion-resistant steel products. Several U.S. steelmakers petitioned for the measure, including U.S. Steel, AK Steel, ArcelorMittal, Nucor Corporation, and Steel Dynamics. U.S. Steel, one of the biggest steel producers in the United States, idled its operations in Granite City, Illinois, in December, costing 2,000 jobs. In late January, U.S. Steel notified the State of Texas that it may lay off up to 700 workers temporarily at its Morris County, Texas, tubular plant. The Pittsburgh-based steel producer is contemplating more plant closures even as the U.S. government imposes new tariffs on imported steel products. “If we can’t be competitive in such a difficult environment and also deal with unfair foreign competition, for whatever reasons, additional plant closures may be necessary,” CEO Mario Longhi said in November during a conference call with analysts following the company’s third-quarter earnings release. AK Steel, another major U.S. producer, reported a net loss of $510.7 million for 2015 on Jan. 26, citing an 11 percent decline in average steel selling prices versus 2014. AK Steel recently closed its Ashland, Kentucky, plant, laying off between 600 and 700 workers. In the U.K., Tata Steel said it would furlough around 1,000 positions at its main Port Talbot, Wales, plant and other locations. Chinese steel mills aren’t faring much better in today’s low-demand steel environment. The Shanghai-listed subsidiary of state-owned Baosteel Group Corp. said that 2015 profits dropped by more than 75 percent to 1.8 billion yuan ($274 million) due to lower prices. Median prices for domestically produced steel at the end of 2015 were more than 25 percent lower than in 2014, according to an index sponsored by the China Iron and Steel Association, a government-backed entity.